EMPLOYEES Provident Fund (EPF) CEO Datuk Shahril Ridza Ridzuan’s statement on Feb 9 that the fund will raise its overseas investment to 26% of its total assets over three years from 23% currently raised eyebrows. Just two months ago, the government issued a directive telling government-linked bodies to hold off on foreign purchases and focus their investment activities at home to support the country’s economic growth. However, on the morning of Feb 13, the EPF announced a 50:50 joint-venture with global industrial assets expert Goodman Group — a deal which will result in a collective investment of up to RM1.4 billion in logistics assets in Malaysia and Singapore. The bulk of the RM1.4 billion (debt and equity) will go to developing world-class logistics assets in Malaysia, specifically in the Klang Valley, Penang and Johor. Shahril dismisses suggestions that there was pressure for the EPF to perform national service. “This [Goodman partnership] is something that we’ve been working on for more than a year. We have a partnership with them in Australia and Europe, so we’re now bringing their expertise to Southeast Asia,” he tells The Edge after witnessing the signing of the JV at the EPF headquarters in Kuala Lumpur. For now, the total equity outlay for the JV is US$200 million (about RM720 million), of which the EPF’s portion is US$100 million, which implies that the remainder of the RM1.4 billion will be debt-funded, explains Shahril, who will complete his first two-year term as CEO of the fund in mid-April. He is currently in his sixth year managing the provident fund, having joined as deputy CEO (investment) on Dec 1, 2009. Incidentally, the 6.75% dividend declared for 2014 also marks the sixth straight year of annual dividend growth — the first time in the history of the EPF, according to data on its website, which dates back to 1952. To be fair, the next best period was the five straight years from 2002 to 2007. The streak was broken by the global financial crisis in 2008. When Shahril was made CEO on April 16, 2013, the EPF said that as part of the group’s long-term diversification strategy, he — together with former CEO Tan Sri Azlan Zainol — strengthened the pension fund’s overseas investments from RM22.39 billion (5.96% of total investment assets) to RM85.7 billion (17.21% of total investment assets). Today, the EPF’s overseas assets stands at some RM146.4 billion — being 23% of its RM636.53 billion investment asset base as at end-2014. Shahril says the EPF, which last year obtained permission from the government to raise the ceiling of its overseas investment to 26%, expects its foreign asset base to expand by about 1% every year but assures that stringent risk-assessments will be made for every investment because of the need to preserve capital while seeking to attain annual returns of at least 2% above inflation. For now, its global investments are yielding bumper returns for the EPF, contributing RM13.01 billion or 33% of total investment income for 2014 while only accounting for 23% of its total investment assets. Incidentally, the RM1.4 billion that the JV intends to co-invest with Goodman is similar to the RM1.39 billion gross investment income that the EPF earned from the RM19.18 billion it invested in real estate and infrastructure assets in 2014. The EPF’s deputy CEO (investments) Mohamad Nasir Latif said investments in real estate can also function as an inflation hedge, apart from providing a steady income stream (rental income). The EPF does not provide a split between its real estate and infrastructure assets, which includes power plants and toll roads. Unlike real estate, which is generally a good inflation hedge, infrastructure assets may expire and could need high replacement costs. The EPF’s infrastructure investments include stakes in toll concessionaires PLUS Expressways (49%) and Grand Saga Sdn Bhd (the Cheras-Kajang Highway) and power plant concession holder, Malakoff Corp Bhd (30%). In Malaysia, the fund’s investments in retail malls include Quill City Mall, Sogo department store and a 30% stake in Paradigm Mall in Kelana Jaya. Even so, considering that only 3.01% (RM19.28 billion) of the EPF’s total assets are invested in real estate and infrastructure, the 3.56% (RM1.39 billion) contribution by the segment to the EPF’s RM39.08 billion gross investment income in 2014 makes it one of the better performers. While RM1.4 billion is only enough to pay 25 basis points or 0.25% of the 6.75% dividend the EPF declared for 2014, the amount is not too shabby considering that its dividend payout only rose 15 to 20 basis points a year between 2009 and 2013 before rising 40 basis points for 2014. In 2014, the EPF needed RM5.43 billion to pay 1% of dividend, significantly higher than the RM3.43 billon required to pay 1% of dividend in 2009 when Shahril joined the EPF. Another strong-performing segment was equities — where asset allocation grew from 27.05% (RM100.43 billion) in 2009 to 42.65% (RM251.6 billion) last year. Income from equities, however, grew even stronger from 28.37% (RM4.9 billion) in 2009 to 58.63% or RM22.91 billion in 2014. Put another way, earnings from equities is more than half the amount of annual dividend declared annually. Some observers have expressed concerns over the size of the EPF’s equity investment, due to the higherinvestment risks for the asset class relative to the EPF’s traditional bread- and-butter investment of government bonds and similar highly rated fixed income assets. But Shahril says the EPF is a long-term value investor that treats equities investment very differently from other traders. “The thing [concern] about equities is there is price volatility but the [intrinsic/actual] value of the asset itself doesn’t change. The job of the EPF is actually to find value, the right assets or stocks that are underpriced on a long-term view because we believe prices will eventually reflect its value. We’re not a short-term investor,” Shahril says. Even so, observers say large swings in equity prices over the short term could wipe out the returns the EPF needs to maintain its good payout. For now, the EPF’s move away from fixed income instruments — which corresponds with the period of record-low interest rate regime globally — have proven prescient. Its investment in Malaysian Government Securities and its equivalents, which makes up 25.8% of its asset base, only raked in 16.9% of total gross investment income for 2014. Similarly, income from loans and bonds were only 19.36% of total investment income although accounting for 25.12% of its total assets. With the EPF’s control of the KwasaLand township (Rubber Research Institute of Malaysia land) in Selangor that could generate some RM50 billion in gross development value, as well as its involvement in other high-profile development projects — such as its 20% stake in the Battersea Power Station redevelopment project in London, 20% stake in the RM8 billion redevelopment of the former Pudu jail site into the Bukit Bintang City Centre, and the expanded partnership with Goodman — its dominance in the real estate market will only grow stronger with time. 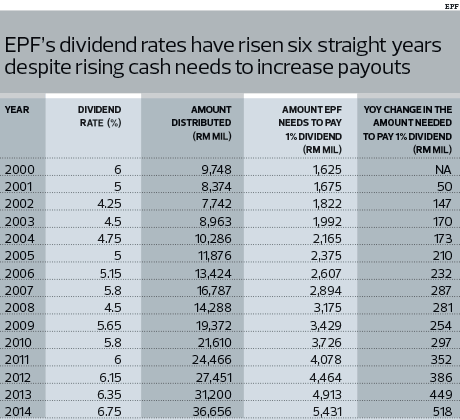 For as long as these investments — which are riskier than its traditional fixed income investments — result in the kind of stellar dividends the EPF has been generating in recent years, there will be little reason to complain. But higher returns often come with higher risks and a higher base means it will be tougher for the EPF to maintain its dividend growth. This article first appeared in The Edge Malaysia Weekly, on February 16 - 22, 2015.